Our bargain choice for August has to be the box set of Vladimir Ashkenazy’s complete concerto recordings from Decca. At little more than £2 a CD this set is well worth purchasing. 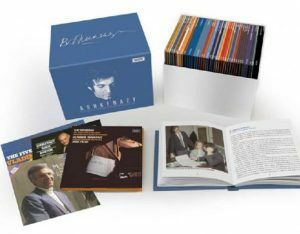 The box, which contains 46 CDs, with original jackets, (and 2 DVDs), provides a great opportunity to reappraise Ashkenazy as a pianist following on from his 70th birthday on 6th July. The set contains three Beethoven cycles, two Rachmaninov cycles, and his Prokofiev, Brahms, Bartók and Mozart cycles and various other works. This duplication of cycles prevented the award of 5 stars, as it may unfortunately dissuade some would be purchasers. However, there is much to be gained from comparing the different approaches to Beethoven and Rachmaninov and should not deter the serious collector. Highlights of the set are the Grammy® award winning recordings of the Beethoven concertos with the Chicago Symphony Orchestra under Sir Georg Solti (1973) and the Rachmaninov cycle with Previn, where conductor and soloist are perfectly matched. We are now publishing regular blogs about new CDs and concerts. Each week we will add one work to our Basic Collection – a great way to start a classical music collection or just to get into some great music. The first two works can be found here. Listen & enjoy! Please email us to let us know what you think of our site and to make suggestions for making it even better! 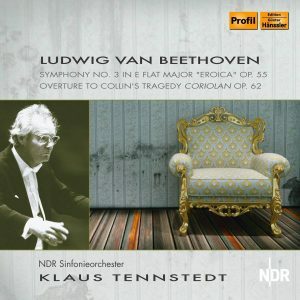 Klaus Tennstedt’s recording of Beethoven’s Symphony No. 3, ‘Eroica’, on the Profil Medien label, enters a competitive and crowded market and sadly does not quite stand out from the crowd. Perhaps the best moments are to be appreciated during the Funeral March, where Tennstedt draws from the members of the NDR Sinfonieorchester a real sense of pathos. This 1979 performance lacks the palpable sense of occasion to be had in his live recording of the same work on EMI with the London Philharmonic Orchestra (available on two disks at bargain price together with Symphonies 6 & 8). On the plus side the performance of the Coriolan Overture has more to offer and rounds off the CD admirably. However, you might choose to spend your money elsewhere. Many readers will be familiar with Villa-Lobos’ Bachianas Brasileiras and some will have heard his music for guitar but few will know his string quartets or symphonies. This month’s Collectors’ Choice comes from Naxos and is a recording of his Symphonies Nos. 8, 9 & 11. It is performed by the São Paulo Symphony Orchestra conducted by Isaac Karabtchevsky. 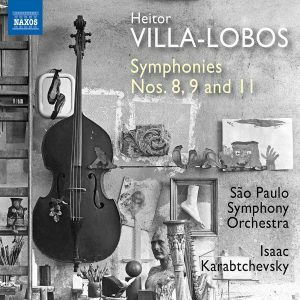 In these compact works there is none of the wild unruliness that characterises much of Villa-Lobos’ popular works but the São Paulo Symphony Orchestra cope well with their demands and the resonant acccoustic suits the works. Well worth adding to your collection! Listen on Spotify or buy from Presto Classical.